Ladies and Gentlemen – Ikit Claw! Ikit Claw. Master Engineer of Clan Skryre. 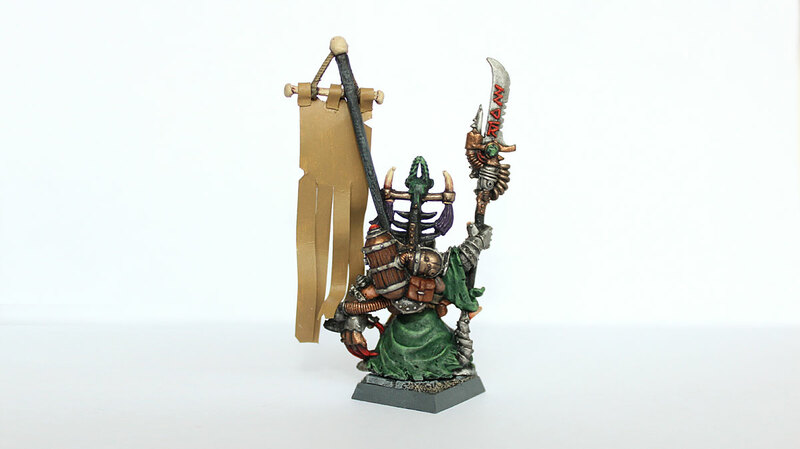 Yesterday I finally finished Ikit Claw, one of my favourite characters from all Skaven Empire. The model is from 4th/5th edition of Wahammer Fantasy Battle – and again – it’s my favourite from all Skaven. Those new and old ones. 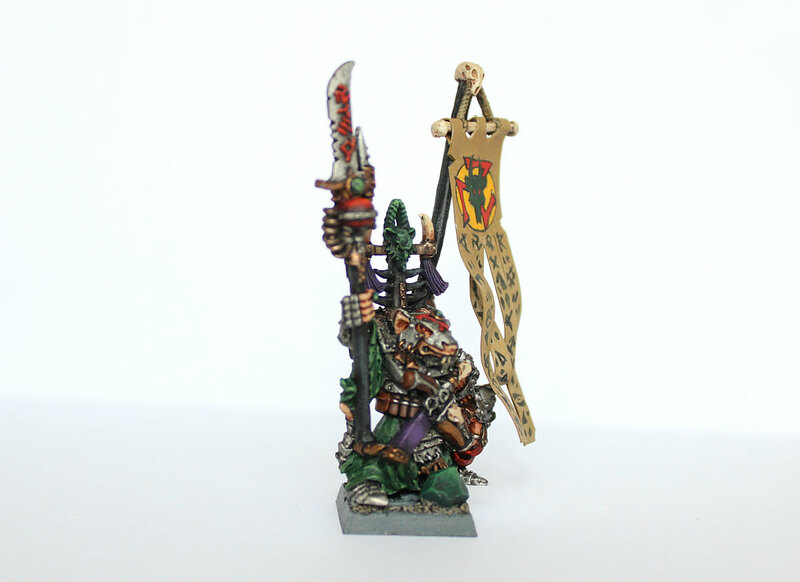 Actually it was one of the very few models I painted during my first attempt to collect Skaven army in 1990/2000s. So – his second version is right now fancier, shiner and better (oh, my skills improved lot during all those years). It took me almost two weeks to finish Ikit – I had so many other things to do. And do not forget, I was out for few days for a weekend, and last week it was my “staycation” ;). Either way, it was too long – but I’m pretty happy with the result. And I can tell the model is finish – proper FINISH. First of all – I added banner. I’m not very good with free hand painting, so I copied the black/white version of Ikit’s banner from old 5th Edition Skaven army book, and I painted all the letters and designs with Citadel the best I could. Then, I cut it off and glued it to the pole. I haven’t done banners like that for ages – so considering this fact – it doesn’t look bad at all. Next one, should look much better (still Stormvermin and Doomwheel banners are in line:). …and second – the bases from Fantascape finally arrived, and Ikit Claw is the very first miniature in my collection with proper base. I was writing about my concerns with choosing the best bases for Skaven in one of recent posts. 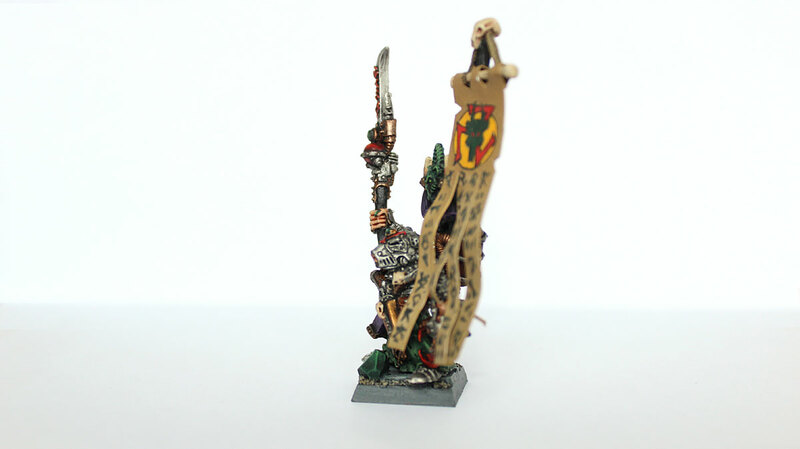 I decided that – Fantascape’s Wyrdstone Mines bases suit me the best. Big shiny warpstone at Ikit’s feet is looking great. Now it’s time to base or other models in my army. It will take some time for sure. 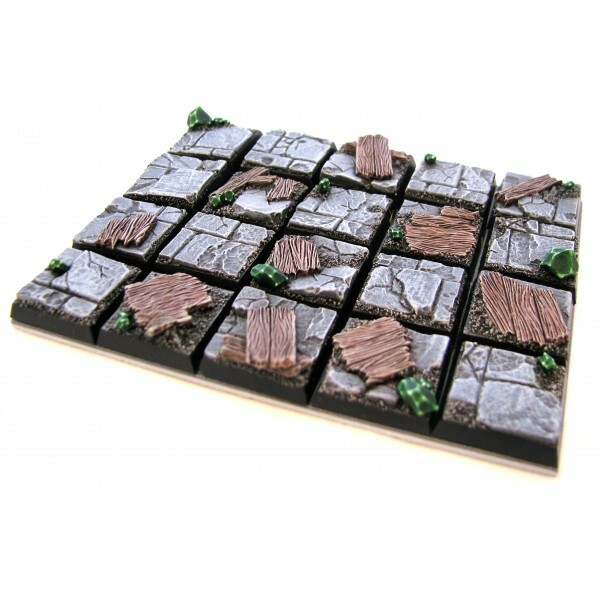 Resin Wyrdstone Mines bases from Fantascape are awesome! He will be my general of course! At least in my upcoming battles of Oldhammer (5th edition of WHFB). The stats are good (Strength 6! ), 4th level of magic, and he is free to choose three magic items beside his Strom Daemon. Good fighter with magical abilities powered by few magical items. He has potential for sure…and one more thing: it is obligatory to spend 25% points in the army on war machines. After all – Ikit Claw is great engineer of Clan Skryre. The war machines like Doomwheel or Warp Lighting Canon are his inventions! For me this fact means even more fun! I will deploy 2 or 3 Doomwheels, probably two Warpfire throwers and couple of Jazzails. Oh, that will be so much joy! Still I’m not sure what enemy I’m going to play. One battle will be against Empire and second – some army chosen from Orcs & Goblins, Chaos or Dwarfs. We will see… The plan remains the same – no matter the opponent – show him the mighty power of Clan Skryre. Doomwheels gonna roll! Wish me luck! After that I will finally sit down over my Blood Angels. Two Tactical, Rhino, Stormraven, Terminators – that’s for the start. Not that much, but time consuming for sure (and I’m going to paint some other models between WH40k minis, to make the work more interesting:). 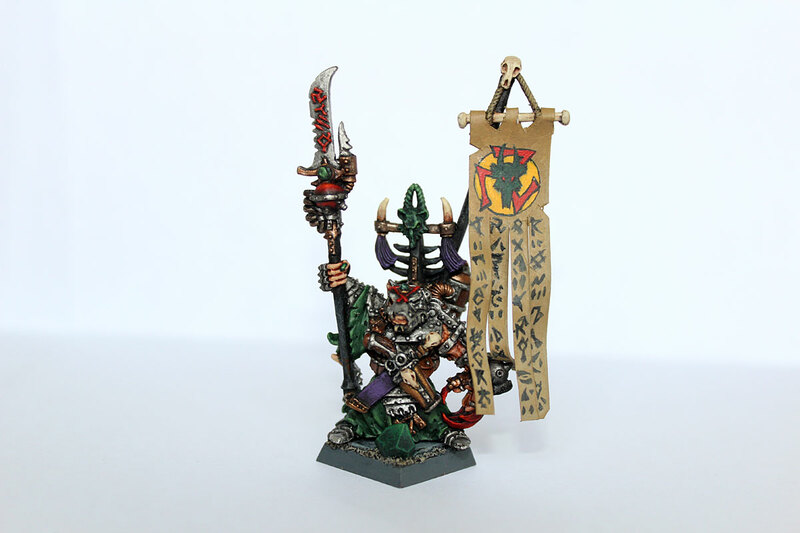 He’s looking really good dude – love the banner too, and those bases really add the finishing touch. Nice work! Looking good! I’ve always loved Jes’ Skaven sculpts, and you’ve done a great job on him here.